Please check out the amazing Kickstarter video HERE and donate if you can! 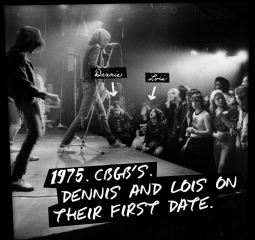 Dennis Anderson and Lois Kahlert’s first date was in 1975 at CBGB, the seminal East Village club. Talking Heads and another band, Television, were on the bill and Lou Reed was shooting pool. “It was like, who do you watch?” said Mr. Anderson, who with Ms. Kahlert became club fixtures, known simply as Dennis and Lois at shows by punk bands and then the British indie bands that followed. They are both 69 now, but Dennis and Lois are still going to shows. Yes, they get kidded about their age, but personal shout-outs from the band onstage often silence that nonsense, Mr. Anderson said. In the 1970s, they became front-row regulars at shows by the Ramonesand began selling T-shirts for the band. “They told us, ‘Since you’re always here anyway, do you want to do merch for us?,’” Ms. Kahlert said, about selling band merchandise. This helped usher them into shows, backstage and eventually on tour with the Ramones, including three trips to England. Over the years, the couple assumed similar roles with other bands, including Oasis, whose lead guitarist, Noel Gallagher, immediately gave them his personal phone number when he met them. “He told us, ‘You’re Dennis and Lois — anything you want,’” Ms. Kahlert recalled. Another band, Happy Mondays, named a song, “Dennis and Lois,” after them. Jon Langford, lead singer and guitarist of the Mekons — a band they have seen hundreds of times — is also an artist, and in the 1990s created a “Dennis and Lois” comic strip for Spin magazine. The couple has no children and enjoys filling a parental role with young rockers on the road. Scores of British musicians crashed in the converted attic apartment in Bensonhurst, Brooklyn, where the couple lived before moving several years ago to Long Island. There are thousands of artifacts and mementos, including toys and action figures, and some 20,000 records. That black leather jacket hanging on the wall belonged to Dee Dee Ramone, the band’s bassist, Mr. Anderson said, pointing out framed photocopies of Mr. Ramone’s high school diploma, birth certificate and passport. As for that tattered pair of long, skinny jeans hanging on the bathroom door, those belonged to the band’s singer, Joey Ramone. Ms. Kahlert used to mend his jeans and hung onto this pair, she said. Between its legs are song lyrics scrawled by Joey on yellow legal paper and a flier from a Pittsburgh pizza place where the Ramones played in 1976. There is also a telegram — “I need your services” — from Joey Ramone to Ms. Kahlert. The couple grew especially close to Dee Dee Ramone and helped him get off drugs and methadone for a time, Ms. Kahlert said. Ms. Kahlert has kept towels and water bottles used by musicians over the years, as a way of collecting “part of their DNA,” as she puts it. Displayed in plastic frames on the bathroom wall is a towel that Joe Strummer once blew his nose in, as well as another towel used by the singer Bryan Ferry of Roxy Music. There is a used undershirt from the singer El Vez, and used socks from members of the British band Gaye Bykers on Acid. Nearby is a lipstick-stained wine glass used by Joni Mitchell. Ms. Kahlert said her collection includes a water bottle used by the singer Patti Smith and another one used by Brian Wilson of the Beach Boys. Mr. Anderson is a retired customer service agent, and Ms. Kahlert, who worked for the architect James Stewart Polshek, retired several years ago. They often fly to Manchester, England, for its thriving music scene. They went five times last year to help keep Ms. Kahlert’s spirits up, in the face of a chronic leg injury that dates back to an Oasis concert in the 1990s. During the band’s hit “Wonderwall” at a concert in Manchester, mosh pit dancers knocked Ms. Kahlert to the beer-soaked floor, she said. During a recent medical scan, Ms. Kahlert said, she scoffed when offered noise-reducing headphones while she was in the machine. “I said, ‘I stood under Dee Dee Ramone’s bass amp for years — this is nothing, believe me,’” she recalled. So far, the only effective treatment has been live music, she said. A performance by Peter Hook, who played with Joy Division and New Order, so energized her that her feeble legs were restored to health afterward for a full day. The couple plans to attend shows as long as physically possible.